How should I approach querying a book with a co-author? Do you prefer literary or commercial MG voice? Anything you’d particularly like to see in MG right now? Please discuss the chapter book market. Thank you. 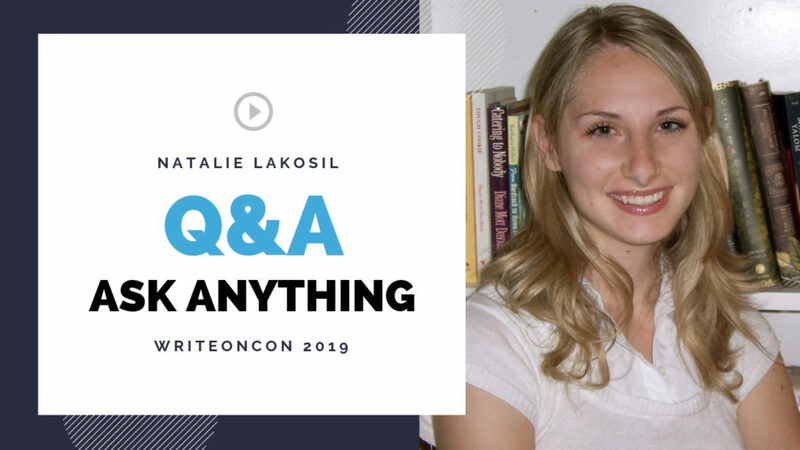 Thank you Natalie for appearing on WriteOnCon! I have often heard that prologues in middle grade and YA’s are a big no-no because of their info-dumping status. Is there ever a time when an agent or publisher would say ok? Maybe in a series where some background would be nice? Any thoughts on the YA market right now, specifically what publishers are looking for and also, what they don’t want? Hi Natalie, thanks for your time. If I’m querying a YA fantasy to an agent and my only published work is a nonfiction science PB (traditional publisher, 2011), do you think I mention it in my bio or leave it out? What do you think makes for a satisfying ending to a picture book? What does your ideal query letter look like? How is it structured? Does it include comps? Do you have advice for those querying the “quiet” more literary, character-driven books? It seems most agents are looking for commercial stories that attract a big advance. Is there a market for YA Sci-Fi/Fantasy if it has a more character-driven bent? My WIP is a Contemporary YA with 2 #AA Muslims (f/f). As a Muslim woman of color who doesn’t identify as #LGBTQIA, is it problematic for me to write this story? Who are your top 3 PB characters and why? I consider myself and NA/YA writer. Is there any hope for college-based or college-aged stories whether contemporary or SFF? I’ve read that certain genres, like fantasy and sci-fi, can get away with higher word counts, but how high is too high? Would a high word count be an auto reject or would you still look at pages? What are some trends that you feel could be on the decline? Which ones are rising and is it possible to query books in genre or trends that might be “dead” but have an MS that has a unique quality to it? When you consider representing a particular author, what’s your next step? What kind of research do you do, or what questions do you hope to answer? Do you have any tips regarding villains? Especially about how to get their motive and characteristics across without monologuing? What should a bio of a query consist of? What are the most important words of advice you can give to aspiring picture book authors in today’s market? If a YA manuscript has three alternating POV’s, should each have their own paragraph in a query (to hit on motivation and conflict for each) or should it be condensed to give the overarching plot premise? If a PB is more of a concept book (family relationships), and the plot is fairly slow, how could I interest an agent when I can’t provide illustrations to help move the story. I don’t have that artistic gift! What type of stories do you think need to be written for the picture book category? What kind of stories do you see too much of? Are there tried and true ways to build emotional connections between characters and readers? What are your thoughts on the word count for MG fantasy? If there’s a unique twist to a novel that’s a big reveal, should the twist be included in the query to an agent or not? In a historical reimagining novel, must the whole world be drastically different than history? Or can the plot hinge on one detail from the past that only changes history only by allowing the main character to be changed as opposed to all of society being changed? And if the change is not drastically different for society at large, would it simply be labeled historical fiction? How would you market an MS written in a new genre something like Gulf Futurism, Kitchen Sink Dystopia, New Weird, -Punk and one I discovered called Jungle Opera? Is the industry kind to unknown or new genres, or must there always be a familiarity when marketing new genres? If you reject a query and the author then does a significant revision over a significant period of time, would you look at a new query for that ms., and if so, would you want to know that context or not? I love your end-of-the-year querying statistics. Have you gathered any other statistics on the publishing industry (your submissions statistics, how other agents querying statistics compare to yours, etc) that you can share with us? Is it okay to hire sensitivity readers even after having an agent? Esp for rep that’s hard to find? Is my ms that is a Chapter Book in subject matter and voice but is 18K in order to tell the story considered upper Chapter Book or lower MG?What do you think is the difference, if any, between these two labels? I write picture books that have been called quiet. Do quiet picture books get picked up and sell? What do you find exciting in the nonfiction picture book market right now? What would you love to see more of? What are your thoughts on unlikeable protagonists in YA? Are agents less likely to take on these types of books. How do you know if it’s time to leave your agent? Brava! That’s the best definition of voice I’ve ever heard. Thank you!!! I keep getting nudged to add agency right from page one to my sci-fi manuscript with an overly shy character. I’m wary of having to make my heroines overnight badasses every single time. What’s your opinion on this? Once you sign a client do you have a hands on editorial approach to get ms ready for sub? Where can I find your blog and query stats? Thank you. What’s the difference between historical fiction and historical reimagining? When pitching new ideas if you have an agent, how does the process work and is a powerpoint presentation okay to present them? I wrote a picture book biography , and just saw that a book on this historical figure is coming out. Will agents still consider my book? is there room in the market for two pbbios on the same person? Is it okay to have two agents even if they’re from the same agency or from different agencies? When querying or pitching, would comps involving video games or music catch your interest. Do you know of many agents that would see it as a positive? What does it mean when an agent says they enjoyed your pages, but they just weren’t connecting enough? Is that a general comment or something specific I can revise with? Hi, Sometimes I hear that agents “don’t connect” with my PB character, even when I try to make them sympathetic. How can I write characters that connect? Hi Natalie, I don’t think the title for my picture book is particularly exciting. How important are titles in a query or pitch?